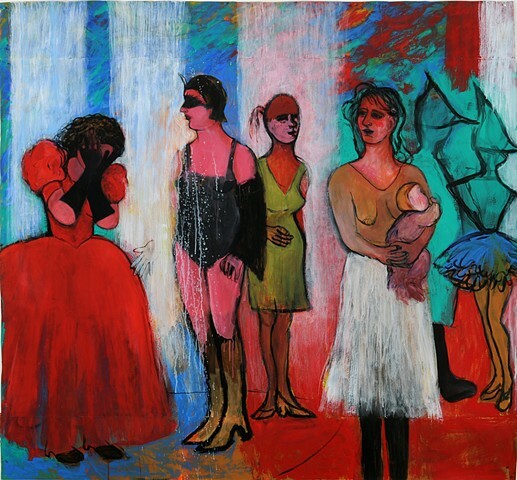 Using the figure as a locus,my paintings investigate the complexity of relationships and the range of human emotion,delving into oppression,conflict and violence. The work chronicles a struggle which embraces despair,moves through the anger and ultimately arrives at revelation,proving that despite our fragility and vulnerability,we are capable of great courage and strength. Fueled by my own journey to overcome obstacles,the work is rich with symbolism and layered with personal history.Loose gestural strokes first define representational forms. Surfaces are energized and agitated,creating interaction and dialogue. Some areas become more rendered,providing insight,while others are obscured. The current series is very large,making my practice highly physical as I interact with the work, and affording me a great sense of freedom.